Here’s another nice fruity summer recipe. I love it that I can now get recipes from my kids in addition to providing recipes for them! My daughter Miriam made this for dessert for Shabbat lunch one hot summer day when we were visiting. It also works as a first course. It’s super-easy and super-tasty. I made this for a meal where one of our guests was diabetic, and substituted Splenda for the sugar. I couldn’t tell the difference, so if you need to replace the sugar, you can do so easily. You can easily double or triple the recipe, but you may have to blend or process in several batches. Clean and hull the strawberries if using fresh. Partially thaw frozen berries. Place Strawberries, apple juice, sugar and lemon juice in a food processor or blender and puree until smooth. Chill until ready to serve. 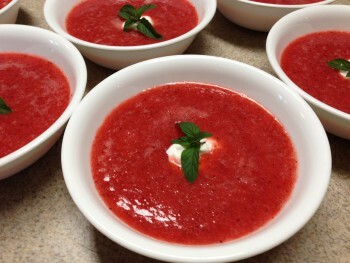 Serve with a dollop of sour cream or Greek yogurt, if desired. Garnish with fresh strawberry slices, kiwi slices or mint leaves. Oh boy! It’s that rare time of year when bing cherries, peaches and blueberries are all readily available at reasonable prices — i.e. 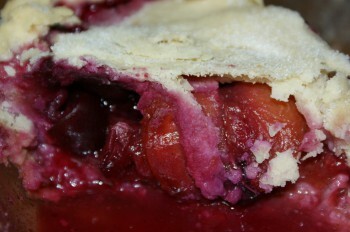 the perfect time to make a Cherry-Berry-Peach Pie, one of my all-time faves. I usually use a frozen pie crust, but if you want to make your own, I’ve added a recipe below. And if you’ve never made a lattice-top pie, fear not — it’s not as hard as you might think, and it’s so pretty! Here is a good video that will show you how. In a large bowl, mix together the peaches, blueberries and cherries. Sprinkle with the lemon juice. Gently stir in the brown sugar, granulated sugar, flour, salt and cinnamon. Line a 9-inch, deep pie plate with half the pastry; trim overhang to one inch. Turn the fruit into the pie. Roll out the remaining pastry and place over the filling. If you like, make a lattice top: cut the dough into thee-quarter-inch strips. Arrange the strips over the fruit in a lattice. Fold the top crust or the ends of the lattice strips under the edge of the pastry and flute the edges. If you like, you can brush the top of the pie with milk or apple juice and a add a sprinkle of granulated sugar. Bake at 450 degrees for 10 minutes. Reduce heat to 350 degrees aand bake 45 to 50 minutes longer, until pastry is brown and fruit is tender. Cut chilled shortening into flour mixture, using a pastry blender, in an up and down chopping motion, until mixture resembles coarse crumbs with some small pea-sized pieces remaining. Sprinkle 5 Tbs. ice-cold water over the flour mixture. Using a fork, quickly stir, drawing flour from bottom of bowl to the top, distributing moisture evenly into flour. Press chunks down to bottom of bowl with fork. Add more water by the tablespoon, until dough is moist enough to hold together when pressed together. Divide dough in two balls, one ball slightly larger than the other. Flatten balls into ½-inch thick round disks. Tip: For ease in rolling, wrap dough in plastic wrap and chill for 30 minutes or up to 2 days. Roll larger ball of dough from center outward with steady pressure on a lightly floured work surface or between two sheets of wax or parchment paper into a circle 2-inches wider than top of pie plate for the bottom crust. Transfer dough to pie plate by loosely rolling around rolling pin. Center the rolling pin over the pie plate, and then unroll, easing dough into pie plate. Fill unbaked pie crust according to recipe directions. Roll out smaller dough disk. Transfer dough carefully onto filled pie. Trim edges of dough leaving a 3/4-inch overhang. Fold top edge under bottom crust. Press edges together to seal and flute as desired. Cut slits in top crust or prick with fork to vent steam. Bake according to specific recipe directions. 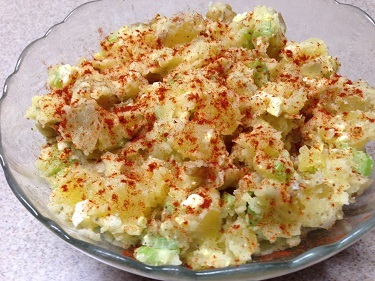 I love my homemade potato salad, and it’s not hard to make! First some tips about the potatoes. It’s best to use a waxy thin-skinned type like Yukon Gold or red potatoes, or small “new” potatoes. If you do, you can keep the skins on when you cut them up for the salad, and they hold their shape better than baking potatoes. If all you have is baking potatoes, don’t worry. Boil the potatoes, and then peel them as soon as they’re cooked — the skin will zip right off. And here’s a foolproof method for making hard-boiled eggs, for those of you who may say you can’t even boil an egg. It works for any number of eggs, as long as they’re in a single layer in the pot. Cover the eggs with cold water and bring to a full, rolling boil. Then turn off the heat, cover the pot and let them sit, covered, for 15 minutes. Drain and place immediately in ice water to cover, until the eggs are cool. This method cooks the eggs completely without giving you that unattractive gray ring around the yolk. What this method doesn’t do is make the eggs easy to peel. The ice-water bath helps a bit, but if eggs are hard to peel it’s usually because they’re too fresh! Really fresh eggs don’t have that little air pocket that develops between the white and the shell. For hard-boiled eggs, it’s best to use eggs that have been in your fridge at least a week after purchase. Wash the potatoes and cut off any imperfections but don’t peel them. Place the potatoes in a large pot, cover with cold water, and bring to the boil. Reduce heat and cook until the potatoes are soft, about 15 or 20 minutes (test by sticking a knife into the largest potato). Rinse the potatoes in cold water, drain completely, and cut them into 1-inch cubes. Place in a large bowl. Chop the hard-boiled egg and add to the potatoes along with the sliced celery and scallion. Add the celery seed, salt and pepper. Combine the vinegar and the mayonnaise and mix well, then pour the mixture over the potatoes and stir well. If the potato salad seems too dry, add a little more mayo and vinegar in the same proportions (twice as much mayo as vinegar). Taste, and correct the seasoning if necessary. Sprinkle the top with paprika to add a dash of color.